In a letter to President Reuven Rivlin, Aliyah Minister Sofia Landver, and Knesset Speaker Yuli Edelstein, Ichud Tel Aviv party candidates Marina Smolyanov and Gaby Daniel proposed setting Yom HaAliyah as a day for municipalities to serve olim. "We're glad that State of Israel designates a day each year, the 7th of Cheshvan, as Yom HaAliyah, or National Aliyah Day, to recognize all of the contributions olim have made to the country," the candidates wrote. "It has been well-documented as part of the nation's development, through financial, social, and cultural contributions, as well as in Israel's very essence of being a country made up of diverse cultures. 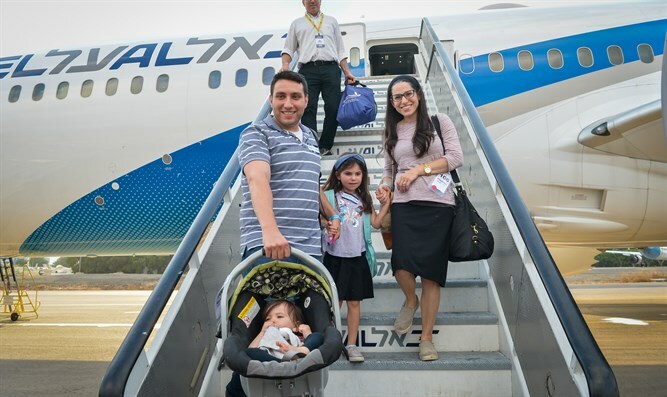 "However, despite the fanfare surrounding this day filled with official government ceremonies honoring olim, the law itself doesn't give anything of substance to olim in their everyday lives, nor does it address the real hardships and challenges that olim face when they move here." According to the law signed in 2016, the Knesset dedicates its daily activities to the subject of olim, and the holiday is observed in educational institutions and at the President's Office as well. It is intended help olim with bureaucratic matters as well as integrating into the country. "For this reason, we from the Ichud TLV party request that Yom HaAliyah becomes a day when municipalities and regional authorities around the country dedicate themselves to opening their doors and helping olim one by one to work out the bureaucratic issues they face. We suggest that this be done in a 'one stop shop' sort of way, where olim can get step-by-step help at city hall. "By encouraging this meaningful addition to the law, the State of Israel would truly be able to thank olim in a proactive, meaningful way that will impact their everyday lives, rather than with a symbolic gesture," the candidates concluded.